Fifteen Minutes of Summer is the third book I’ve read by author Heather Wardell. It is Book #3 in her “Seven Exes” Series, and it’s her 17th novel written. As obvious as the title might seem, this book is not about the summer season per se. It is the story of a woman named Summer. She has been an important character in the series, and in this book we get to know more about her, the reasons that justify her actions when she betrayed her friends and former cast members of a dating reality-TV show that took place on an island. 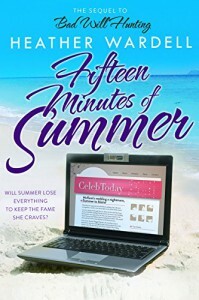 The title is so appropriate because when faced to choose between her friends or her career, Summer does get her fifteen minutes “fame”. Fifteen Minutes of Summer can be read as a standalone; the author gives you some details that help you understand the plot and main conflict. But being that it is part of a series, reading the previous book(s) would give you more background and a better feeling of continuity and understanding of the story. Having read the previous book in this series (click for review), I admit I was biased against Summer. Her betrayal and actions didn’t make her look like a good person. Her character is very complex. I tried to like her but I couldn't fully like her and at the same time I couldn't hate her. More about this on the full review on my blog. As with the other books by Heather Wardell, this story is not another women’s fiction story. This is a story of Women’s Fiction with a Plus. Summer’s story isn’t just a story about a girl trying to make it in show business hurting herself and loved ones on her way. It is a story about the meaning of friendship and most of all a story about forgiveness. Fifteen Minutes of Summer deals with the subject of sexual harassment. Even though the events in this book are fictional, they are eye-opening. We can’t deny that situations like those portrayed in the book regarding sexual harassment may or may not be happening in real life. I would recommend this book for young women who are just joining the working force especially in show business, hoping that they don’t imitate Summer’s actions but learn from her mistakes and be aware and prepare themselves if God forbids they are faced with a situation like this. Book clubs can also find this book as an interesting way to discuss topics like work ethics, codes of conduct and the price of fame. If you’re looking for a book about a woman who makes mistakes and amends them, this is the book for you. If you’re looking for a book that makes you think of what you would do for fame, this is the book for you. If you’re looking for a story about the true meaning of friendship and forgiveness, this is the book for you. Summer ends on September 22nd, 2015 in this neck of the woods, if you’re looking for a good fast paced story to read in the last “15 minutes” of the summer season we have left, this is the book for you.